In Italy, malaria was an endemic disease that was eradicated by the mid-20th century. This paper evaluates the prophylactic and therapeutic remedies used by folk medicine to cure malaria in Calabria (southern Italy). The data has been collected by analysing works of physicians, ethnographers, folklorists and specialists of the study of Calabrian history between the end of the 19th century and the 20th century. The data collected have allowed us to describe the most common cures used by the Calabrian people to treat malaria and the most evident symptoms of this disease, such as intermittent fever, hepato-spleenomegaly, asthenia and dropsy. This approach uncovered a heterogeneous corpus of empirical, magical and religious remedies, which the authors have investigated as evidences of past "expert medicine" and to verify their real effectiveness in the treatment of malaria. Malaria is an infectious disease that is caused by the Plasmodium parasite. This disease is transmitted to humans via the Anopheles mosquito. Malaria is a very ancient disease, and although it was not possible to prove its presence in ancient human bones, this disease was probably present among Homo genus ancestors . Different populations, such as the Sumerians, Assyrian-Babylonians, Indians, Egyptians and Chinese, experienced seasonal and intermittent fevers . In the Mediterranean area, particularly in Italy, malaria was an endemic disease that was eradicated by the mid-20th century. Moreover, the persistent and lasting presence of malaria determined an interesting state of debility of the affected subjects and a consequent weakening of the labour force, which led to some important and detrimental socio-economic consequences . Folk medicine approaches were used in an attempt to treat several of the most evident effects of malaria, such as intermittent fever, hepato-spleenomegaly, asthenia and dropsy. It is our aim in this work to identify folk medical cures that were used by the Calabrian people for the treatment of malaria, as evidenced in writings produced between the 19th and 20th centuries. The authors have also examined whether same remedies were already described by Pliny the Elder, Dioscorides, Galen and Serenus Sammonicus, so to be considered as evidence of past "expert medicine". It is interesting to point out that in some peninsular and insular areas of Italy, despite all the drainage attempts initiated in the 16th century, malaria-associated mortality was only recently eradicated in the mid-20th century (Figure 1) . Among the southern regions of Italy, Calabria was one of the regions that was most affected by malaria. The disease was endemic along its coasts (about 738 km), along its most important rivers (Mesima, Lao, Crati, Tacina and Neto) and within the valleys of its broad streams. 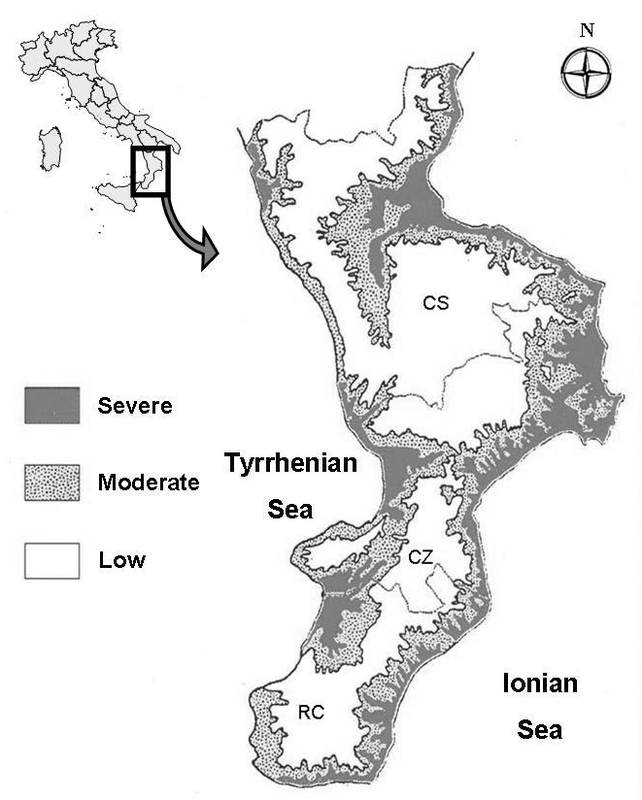 The disease was prevalent in 52% of the Calabrian territory (7,877.31/15,080.32 km2) (Figure 2) . Calabria showed both natural and antropic factors that favoured the spread of Plasmodium, as well as the endemic and century-old presence of malaria in its territory. Physical features that may have affected the spreading of malaria are represented by a rich hydrographic reticle and the occurrence of seismic phenomena (bradyseisms and earthquakes), which, at that time, contributed to increase the hydrogeological disorder, thus creating many different wet areas (for example, the single earthquake of 1783 created about 215 lakes), which are the favourite environment of the anopheles mosquito . The antropic factors are represented fundamentally by latifundia, deforestation and the very poor social and economic conditions of the rural Calabrian people . 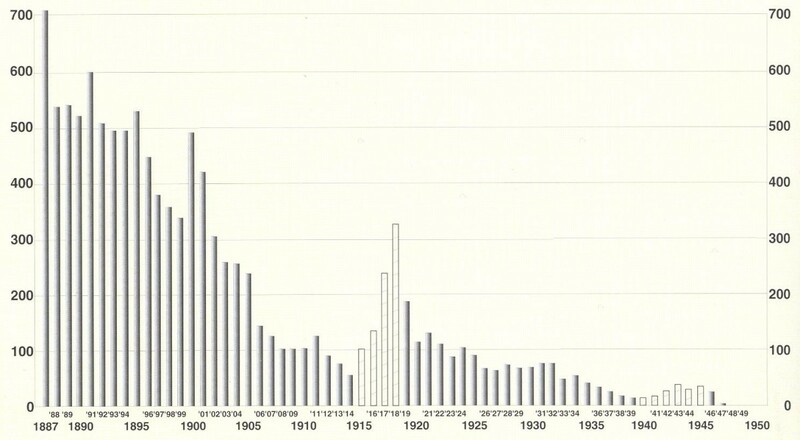 Reduction in malaria mortality in Italy from 1887 to 1950 (number of deaths per 1,000,000 inhabitants). The white histograms refer to the years of the First and Second World War. Source: A. Coluzzi, modified by the authors. Distribution of past malarial prevalence in Calabria (Southern Italy). The map shows the old administrative division in three provinces (CS Province of Cosenza, CZ = Province of Catanzaro; RC = Province of Reggio Calabria). Source: A. Tagarelli. Calabria is the southernmost region of peninsular Italy; it borders with the Ionian Sea to the east and south, with the Tyrrhenian Sea to the west, and with the region Basilicata to the north, and it extends for about 250 km from north to south in the middle of the Mediterranean Sea. Calabria reaches 15,080 km2 and 42% of its territory is represented by mountains: the Apennine mountain range - the southern Apennines, calcareous, with Pollino Massif (Serra Dolcedorme, 2267 m a.s.l. )- and the Calabrian Apennines, mainly siliceous - with the Coastal Range (M. Cocuzzo,1541 m a.s.l. ), Sila Massif (M. Botte Donato,1929 m a.s.l. ), Serre Calabre (M. Pecoraro, 1423 m a.s.l.) and Aspromonte Massif (Montalto, 1956 m a.s.l.)-. 49% of Calabria's territory is represented by hills and only 9% is flat. The plains are restricted to coastal areas and only three plains extend into the internal areas of the territory (Sibari plain, Saint'Eufemia plain and Gioia Tauro plain). The climate is Mediterranean, with maximum precipitation during the winter and minimum in the summer and vice versa for the temperature. Precipitation is represented by about 1,041 mm of rainfall per year. The average temperature in the coldest month (January) is about 8.3°C and the warmest month (August) about 24.4°C, with an annual average of 15.8°C . However strong meso-climatic variations occur depending on altitude, topographic features and location with respect to the sea. From both an anthropological and an ethnobotanical point of view, Calabria is an interesting region, for the historical presence of several populations (Greeks, Romans, Byzantines, Arabs, Normans and Spanish) in the past that influenced the local culture . Finally, it is interesting to note that the Arbëreshe community, of Albanian origins, settled in this region since the 16th century and is currently located in 25 communes in the provinces of Cosenza, Catanzaro and Crotone . This study is based on the analysis of works written by physicians, ethnographers, folklorists and specialists of the study of Calabrian history between the end of the 19th century and the 20th century, in particular when both ethnographic and anthropological research focused on the study of folk medicine. For this reason, the authors have also consulted the check-lists about works on calabrian folk medicine and beliefs, edited by Lombardi Satriani  and Cavalcanti . The sources used in this work are listed in Table 1. The data collected has allowed us to describe the cures used by the Calabrian people to treat malaria and its most evident symptoms, such as intermittent fever, hepato-spleenomegaly, asthenia and dropsy. This approach uncovered a heterogeneous corpus of empirical, magical and religious remedies, which the authors have investigated as an "official medicine" to cure malaria in the treatises by Pliny the Elder (Naturalis Historia) [13–15], Dioscorides (De Materia Medica) , Galen (Opera Omnia) [17–21] and by Serenus Sammonicus (Liber Medicinalis) . These authors, in fact, have influenced medical practice in latter centuries . Physician, malariologist who wrote about malaria in Calabria. Physician whose daily experiences provided information about folk Calabrian medicine. Folklorist who published many works about folk culture including therapeutic remedies to cure many diseases. Folklorist and historian who wrote about folk traditions in Laureana di Borrello (province of Reggio Calabria). He published a vocabulary of south Calabrian dialect with historical and folkloric notes as well. Folklorist and ethnographer who published many works about the Calabrian people. Historian and linguist who published a vocabulary of north Calabrian dialect with historical and folkloric notes. Man of letters who published many papers about Calabrian beliefs and traditions including the use of plants and animal to cure many diseases. Mathematician who edited the statistical report of the Kingdom of Naples of 1811. Franciscan monk who wrote a book about the religious cult of the Madonna in the province of Cosenza. Writer who published a book about Calabrian folk traditions. Physician who published a work about anti-malaria prophylaxis. Historian and man of letters. He wrote an important book about the economy, history and environment of Calabria. Man of letters was author of a paper about folk Calabrian medicine. Physician and author of a paper about folk medicine in Cassano (province of Cosenza). Along with Lombardi Satriani, he was one of the most important Italian folklorists and etnhographers. He wrote many works about amulets. Priest who wrote a paper about folk medicine in Nicotera (province of Catanzaro). Botanist who published a work on Prunus spinosa L.
° Refers to the year of publication of the works examined. The plants used by Calabrian people to cure malaria (N = 53) have been identified as species because the sources described them with their scientific name (34% of cases, 18/53), or with their Italian name (60% of cases, 32/53). In the latter case, we attributed a plant to a species only if we were absolutely sure about it (for example "olivo" (olive) = Olea europaea L.); in the other cases we classified the plants only through their genus (for example "quercia" (oak) = Quercus spp.). Furthermore, due to the presence of different dialects in Northern, Central and Southern Calabria, the analysis of the different historical sources required the use of two historical dictionaries of Calabrian dialects [24, 25], which were used to translate several ancient terms (that are not used today) into Italian in 4% of cases (2/53). This has allowed us to attribute the local name "vruca" to the genus Tamarix spp., while it has not allowed us (2% of cases, 1/53) to attribute the local name "catabuzzico"  to any genus. Finally, the plants used to cure malaria in Calabria (N = 52) have been compared with their pharmacological and biological properties [27–48] and with their current use in Calabrian folk medicine, defined by recent fieldworks [49–51] [Table 2]. Medical use of plants to heal malaria in Calabria, bio-pharmacological properties and current use in Calabrian folk medicine. Capsicum annuum L. Var. acuminatum Fing. The family names of the plants recorded in this work follow the Angiosperm Phylogeny Group guidelines . The empirical remedies that were used by the Calabrian people, as evidenced by the sources consulted in this work, were used both prophylactically and therapeutically, and were based on drinks, objects, animals, plants and other sources; some of these elements were created ex novo, while others were inherited from the "official" medicine of 1th-3th century AD [Tables 3 and 4]. Medical use of plants to heal malaria in Calabria, mentioned by historical sources used for the research. Urtica dioica L., Urtica urens L.
Medical use of animals to heal malaria in Calabria, mentioned by historical sources used for the research. Empirical prophylactic remedies. One of the most commonly used prophylactic empirical remedies was bleeding (which was already described by Galen that affirmed "Saluberrimum igitur, ut praediximus, est in febribus venam incidere" (during the fever, as mentioned, it is very useful to incise a vein) (De Methodo Medendi XI, 15) . Bleeding was performed preventively by "barbieri" (barbers) and "magare" (witches) during the month of March . During the same period (when the cure was called "marziale"), Calabrian people drank different types of decoctions, such as those made with "durcamara" (Solanum dulcamara L.), "acropastu" (Cynodon dactylon (L.) Pers. ), "strazza buttuni" (Smilax aspera L.) and "fumaria" (Fumaria officinalis L.) [11, 54]. To prevent contagion of the disease during the night in the summer months, people slept for few hours and near a fire [54–56]. Moreover, they drank strong spirits or wine. In particular, they were advised to drink half a litre of wine on an empty stomach [57, 58], eat garlic (Allium sativum L.) , smoke and chew tobacco and swallow the spittle [56, 60], while always maintaining the pipe in the mouth [54–56]. On awaking, it was recommended to eat a macerate of raw garlic in vinegar . Finally, people living on the coast used to spread olive oil mixed with absinth on their bodies, according to Dioscorides who affirmed "Itemque ex oleo perunctum, culices abigere, ne corpus tangant" (Rubbed on with oil it forbids the mosquitos to touch the body) De Materia Medica, III, 23) [16, 61] and according to Pliny "culices ex oleo perunctis abigit" (who use this oil keep mosquitos away), Naturalis Historia XXVII, 28) . Empirical therapeutical remedies. Fasting and purging were recommended for the treatment of malaria-associated fevers. Fasting was thought to appease fever, while purging was thought to remove the malaria-causing parasite from the affected organism. In general, purging was achieved via the administration of ricinus seeds (Ricinus communis L.) and by using the root of "savucu" (Sambucus nigra L.) . Fasting and purging were inherited from Galenic medicine. Galen wrote the following about fasting: "(in tertiariis) ... neque quotidie cibum dare oportet, sed alternis diebus abunde fuerit" (with tertian fevers ... food must not be offered every day, but on alternate days) (Ad Glauconem de medendi methodo I, 11) ; and about purging: "ac vacuatio quidem excrementorum omni febri est utilissima" (during the fever, no doubt, it is very useful to defecate) (Methodo medendi IX, 10) . Other treatments aimed at purging and restoring the affected subjects were also used. These included the decoction of "gamumilla" (Matricaria chamomilla L), "ordica" (Urtica dioica L., Urtica urens L.), and the decoction of the root of "alivu" (Olea europaea L.) or of the rhizome of "canna" (Arundo donax L.) [26, 62, 63]. Several empirical therapeutic remedies against malaria-associated fevers were loathsome. These included the ingestion of the subject's own urine, that of young virgin or that of a healthy woman (in particular, the affected subject was advised to drink 100 g of the urine of a non-affected woman early in the morning) [55–57, 64], the consumption of various animals (or parts of animals), such as earthworms (Lumbricus terrestris) which were previously placed in the oven and pulverized, or two or three bedbugs (Cimex lecturalius) within a Host [56, 58, 64]. Moreover, patients were encouraged to eat pills of "pappici" (cobweb) [26, 56, 63–66], the head of a viper (Vipera aspis), fried and mixed with absinth , goat (Capra hircus) dung within a Host, eaten from morning until midday [26, 57], one spoonful of coffee per hour  and pills of soot [67, 68]. Alternatively, to cure hepato-spleenomegaly were used hedgehog (Erinaceus europaeus) or ox (Bos taurus) gall and goat (Capra hircus) dung . As three "Cantarelle" (Cantharis vescicatoria) minced in water were used as a diuretic against dropsy . Calabrian people believed without any doubt in the remedies described above; however, they also used numerous plants to cure malaria. Some of these plants are still currently used in Calabrian folk medicine to cure various diseases [Table 1]. Many decoctions or infusions of various herbaceous species were used to cure malaria-associated fevers. These herbaceous plants included "issopu" (Hyssopus officinalis L.), "valariana" (Valeriana officinalis L.), "filici masculu" (Dryopteris filix-mas (L.) Schott. ), "lupinu" (Lupinus albus L.), "cametriu" (Teucrium chamaedrys L.), "brundulija" (Erythraea centaurium (L.) Borkh. ), "centu gruppa" (Centaurea centaurium L.), "centarva" (Centaurea benedicta L.), "sarvia" (Salvia officinalis L.), "rosamarinu" (Rosmarinus officunalis L.), "nepitella" (Calamintha nepeta (L.) Savi), "ruta" (Ruta spp. ), "erva janca" (Artemisia absinthium L.), "cipuddra" (Allium cepa L.), "agliu" (Allium sativum L.), "millefoglio" (Achillea millefolium L.), "erva pignola" (Borago officinalis L.), "marrobio nero" (Ballota nigra L.), "campezio" (Ajuga chamaepitys Guss. ), "elitropia" (Heliotropium europaeum L.) (which was ingested with white wine), "genziana" (Gentiana lutea L.) and "erba i la crucivia" (Verbena officinalis L.) [11, 26, 55–58, 60, 62–65, 67–72]. Some ligneous species must be added to this list, particularly the following plants: the aerial parts of "vruca" (Tamarix spp. ), and "leandru" (Nerium oleander L.); the leaves of "alivu" (Olea europaea L.) and "calipsi" (Eucalyptus spp. ); the roots of "granato" (Punica granatum L.), "cucumele" (Prunus spinosa L.), "savucu" (Sambucus nigra L.), and "cerza" (Quercus spp.). The bark of "cucumele", "cerza" and "salici" (Salix spp.) was also used [24, 26, 55, 58, 62, 65, 68, 69, 72, 73]. Other remedies were similarly efficacious; these included the mesocarp of "nuci" (Juglans regia L.) chopped finely and mixed with wine, "bergamotto" (Citrus bergamia Risso), "limuni" (Citrus limonum Risso, which was broken, boiled and maintained fresh overnight, then drunk at breakfast for three mornings), "pipi nivuru" (Piper nigrum L.), "pepe arsente" (Capsicum annuum L.) and ten bitter seeds of decorticated "lupinu" (Lupinus albus L.), taken in the morning [11, 56, 58, 60, 62–65, 68, 74, 75]. Other than fever, the most evident symptoms of malaria are hepato-spleenomegaly and dropsy. We also found descriptions of several remedies for these symptoms. There were many cures for hepato-spleenomegaly: a decoction of the root of "chiappara" (Capparis spinosa L.), or of "acropistu" (Urtica dioica L., Urtica urens L.), the latter taken together with potassium nitrate in the morning; eating "cipuddra" (Allium cepa L.) or "pipi" (Capsicum annuum L. Var. acuminatum Fing. ), the latter together with a strong wine. Finally, another remedy involved the use of "cucumaju" (Chelidonium majus L.) [55–57, 60, 63, 68, 76]. To treat dropsy, which was called "acqua 'ntà panza" (water in the stomach), Calabrian people used several diuretic remedies, such as "erba i muru" (Parietaria officinalis L.), "cipuddazza" (Urginea maritima (L.) Baker), and "cametriu" (Teucrium chamaedrys L.) [11, 26, 55, 56, 62, 66]. Because of the presence of malaria in the daily lives of Calabrian people, this disease was considered a normal life trouble; however, its most dangerous and deadly forms were considered by Calabrian people as a condition of supernatural nature. Therefore, they resorted to magic remedies that were believed to "link" the disease. These included, in particular, wearing a "nuci trischéra o a tri guarri" (a three-valve walnut shell) (Juglans regia L.), a spider that was enclosed between two shells of a walnut or skin, skeleton and fangs of snake, the latter extracted when animal was still alive, as it was believed that the disease would then affect the walnut, the spider or the parts of the snake, and not the subjects who wore these amulets [65, 77]. Furthermore, a live "carpurita" (Pachyiulus communis) was sewn into the clothes of the affected subject (without the patient realizing it) or a "paletta" (Opuntia ficus-indica (L.) Mill.) was placed near the fireplace. It was believed that when the animal died, or when the stem of the plant dried, the fever or the hepato-spleenomegaly would disappear [26, 60]. In an analogy with the ancient belief in the therapeutic principle of "contact", to defeat spleenomegaly Calabrians were encouraged to place "erba i la crucivia" (Verbena officinalis L.) on the abdomen of the affected subject before sleeping, as it would absorb the "bad blood" [56, 57, 62]. Finally, every morning the affected subject had to urinate on "cucuzzielli acriesti maturi", the fruits of Ecballium elaterium (L.) A. Rich., to transfer the disease from the subject to the fruit . Calabrian people alternated or combined both empirical and magical remedies and, very often, used prayers and acts of devotion, as diseases were believed to be associated to divine punishment. Thus, in Cosenza (Northern Calabria) the "Madonna della Febbre" was invoked with prayers, ex voto and pilgrimages ; in Castrovillari (province of Cosenza), the prayer to the "Madonna d'Itria" was as follows: "Madonna mia 'i L'Itria, chi stai 'nganna a'sta jumara fammi passà 'sta freva 'i quartana c'u jurnu tuju non vugghiu mangià panu" ("My Lady of Itria, close to the river, let the fever out and on your commemoration day I will not eat bread") . The methodology based on the analysis of historical sources regarding Calabrian folk medicine remedies for the prophylaxis and treatment of malaria, if not compared with similar studies, can be considered a case study where the ordinary methodologies of ethno-medical-biological research are combined with the methodologies pertaining to historical-anthropological sciences. In addition, this is part of a debate regarding the association between ethnobotany and ethnopharmacology and other disciplines, to improve our understanding of the human usage of plants . Moreover, this work complies with De Natale et al. , who created a database of the historical use of plants in the popular medicine of the Mediterranean basin. However, this study has revealed some interesting and heterogeneous features regarding Calabrian popular medicine practices used to prevent and treat malaria, some of which were inherited by the Calabrian people from the "expert medicine" of the past centuries. The first type of practices that we have described were characterized by a rational approach. Indeed, the use of medicinal plants, 69% of which (36/52) is recognized by the current pharmacopoeia as having some pharmacological/biological properties, succeeded in assuaging temporarily the most evident sufferings associated with the disease (fever, hepato-spleenomegaly, asthenia and dropsy) as well as its complications, such as the proneness to bacterial infections, even if did not cure the malarial infection. 23% (12/52) of the plants which were used by Calabrian people to treat malaria, have pharmacological/biological properties which did not allow to relieve the symptoms of malaria; however, they did not damage the affected subjects. Finally, 8% (4/52) of these plants were characterized by some pharmacological/biological properties which could be harmful for a malarial subject; or these properties could even be poisonous both for the malarial and the healthy subject. The second type of practices were linked to the magic tradition of Calabrian folk medicine which, like the traditions of all Southern Italian regions, is rich in myths, symbolism and fantastic representations . Thus, malaria became a synonym of "malia", or, as Pasquarelli  affirmed, it became "an aspect of paludism". Malaria was thought to be a consequence of a malefic element that affected the behaviour and the life of an individual; therefore, only a magic cure could remedy the disease. The third type of practices were characterized by a strong principle of ineluctability, which is currently present among the Calabrian society: the sick entrusted God with prayers or acts of devotion, with the conviction that only God would be able to provide recovery from the disease. The use of plants combined with other cures, such as the use of spiders, cantharis and leeches, represents prophylactic or therapeutic elements inherited from ancient medical science, some of which were still used to treat malaria in hospitals and in general by 19th-century physicians, before the introduction of quinine. This element is very interesting; while the empirical and magic remedies were not based on the symptomatology of the disease (they were rather "psychological and protective" elements ), the use of plants represented a real treatment, and served as a popular medicine base to treat various diseases. In conclusion, the remedies described in this work allow us to establish the link between malaria and Calabrian people, so that Turner's statement that "the more widely or intensively a plant is used, the greater is its cultural significance"  can, in this case, be extended to malaria; the more folk remedies are used to cure malaria, the greater is the significance of its historical, medical and social meaning. GT conceived of the study, collected and analyzed the data, drafted the manuscript. AT and AP supervised the work at all its stages.